(L-R) Arya Shahi, Matt Nuernberg Ryan Melia, Curtis Gillen. Image by Joan Marcus. The performers on stage and the design crew supporting currently at The Judson Gym, most students together at Carnegie Mellon, have honed a delectable story telling style that is part shadow puppetry, part sleight-of-hand, part camp counselor flashlight effects, and all totally charming. PigPen Theatre‘s The Old Man and the Old Moon gives us a story of magic and mystery and folklore that will bring to mind a number of barebones storytelling productions with energy and wit, in different measures, of recent years. Peter and the Starcatcher, Bloody Bloody Andrew Jackson, The Scottsboro Boys, Mary Zimmerman’s Argonautika. And yet, the energy, the synergy, the charm, the heart of this production and this ensemble have their own flavor and power. The ensemble seems to draw lots at the beginning of the show for at least one role, and the playbill does not designate permanent roles for performers, to it is unclear to me whether individuals permanent portray the characters they played for my performance. (Perhaps this is a reason among many for me to revisit this charming piece of theatre.) As for story, it can be told in a few sentences. An old man lives with his wife of many years by an unnamed sea, fishing by day and filling the moon with light by night (yes, folklore, roll with it). His wife, seeking adventure beyond the limits of a walk near their simple home, sails off one evening and he follows her, encountering a giant human swallowing sea creature and ghosts, a set of wandering sea men, a sailing dog, finally finding his heart’s desire. Our old man seeks his mate on faith, finds enchanting poetry and set pieces to climb (design by Lydia Fine and Bart Cortright) and puppets that tell part of his story (puppetry by Lydia Fine and Pigpen Theatre Co.) and sea shanty-ish music that is part of the story and sometimes a welcome pause in the action. The twist on this story is that it is not entirely “there is no place on home” with our old man resolved to stay in his familiar homestead — his journeys may yet continue. Pared to its essence, story telling is enchantment and truth. In this case it is all of that and more. The Old Man and the Old Moon is a play with music in which words inform the melody and the songs augment the storytelling in delicious ways. 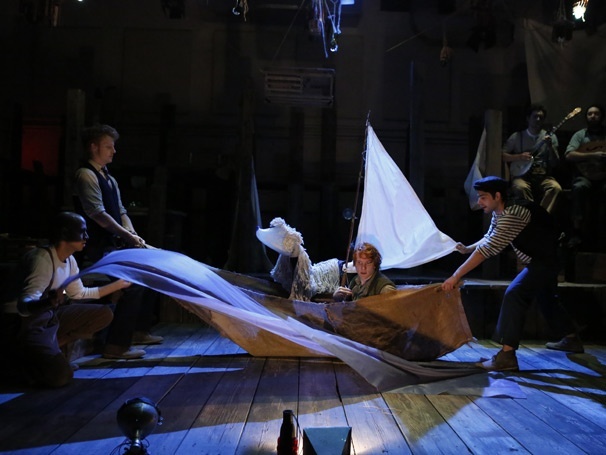 For a taste of the puppetry work and music that inform this production, see this animated short Bremen, bearing the same name as PigPen’s 2012 debut album. The album will be re-released October 9, 2012, associated with a series of Monday evening concerts at Joe’s Pub in Fall 2012.